The ATOM Project Honourary Ambassador Karipbek Kuyukov welcomed with “optimism” the agreements reached during the historic April 27 summit between North and South Korea. Kuyukov’s comments follow the Friday meeting between North Korean leader Kim Jong-un and President Moon Jae-in of South Korea in Panmunjom in which the leaders agreed to work to remove all nuclear weapons from the Korean Peninsula and hold talks over the next year with the United States to reach an official peace treaty to end the Korean War. “South and North Korea confirmed the common goal of realizing, through complete denuclearization, a nuclear-free Korean Peninsula,” read a statement signed by Kim Jong-un and Moon Jae-in after their meeting, reported The New York Times. The meeting was the first time a North Korean leader had entered South Korea. The two countries have been operating under a Korean War truce and a peace treaty has been among the incentives North Korea has sought in return for dismantling its nuclear program. The ATOM Project Honourary Ambassador Kuyukov was born in Yegyndybulak village, just 60 miles from where the Soviet Union conducted more than 450 nuclear weapons tests over four decades. As a result of his parents’ exposure to the radiation from those tests, Kuyukov was born without arms and an older brother and sister died within a year of their births. 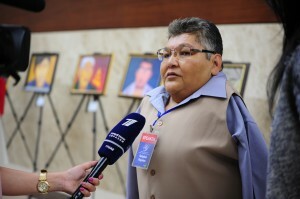 Kuyukov has since overcome those challenges to become a renowned painter, global antinuclear weapons activist and Honorary Ambassador of The ATOM Project. He has spoken at The Hague, the Carnegie Endowment for International Peace and the United Nations headquarters, among other international organisations. Kuyukov, along with Kazakh President Nursultan Nazarbayev, were nominated in 2017 for the Nobel Peace Prize. Following the news of the historic summit, Kuyukov said that if North Korea ultimately dismantles its nuclear arsenal, North Korea will join Kuyukov’s home country as an example of the positive effects of denuclearization.